Accra, Nov. 21, GNA - The National Chairman of the National Democratic Congress (NDC), Dr Obed Yao Asamoah on Saturday called on Ghanaians to vote for change in Election 2004, saying: "The ruling New Patriotic Party (NPP) is power drunk and short of fresh ideas for good governance. "The Elephant is power drunk, Elections 2004, therefore offer Ghanaians the opportunity to stop the arrogance, intimidation, exploitation of the vulnerable and other inhumane policies. 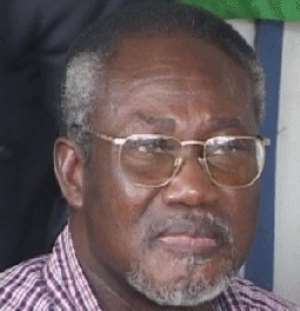 We don't need a government, which will continue to exploit us," Dr Obed Asamoah stated. Dr Asamoah, who was speaking to the Ghana News Agency in an interview, said the electorate should vote for leaders, who would take radical and sustained steps to ensure national unity and development. "No one can convince me that we are better off under the present national Leadership. We made poor electoral judgement in Election 2000, as a result we are poor, underdeveloped, living in very deplorable conditions and in filth; the nation is more divided now than four years ago. We need change." The NDC Chairman said allegations of bribery and corruption that characterised the internal politicking of the ruling NPP during its primaries attested to a power drunk group that wanted to use all means to hold on to power. He urged the electorate to eschew ethnic and tribal sentiments, which "cloud our objectivity even when we need to establish national priorities and make crucial national choices and vote massively for the NDC on December 7". Dr Asamoah said in their desperation to hold on to power the NPP had adopted the politics of lies and exhibition of political luxury to confound the electorates, adding, "they are simply insensitive to the plight of Ghanaians all that they want is power". He explained that lies disintegrate the society and called on the electorate to be mindful of such propagandists, who were out to deceive them. NDC with its social democracy ideology was seeking the mandate of the people, to serve and offer human centred policies that would improve their conditions. He said the NDC still had a lot to do and called on the electorate to vote it back to power to ensure rapid development. The NDC Chairman said the Party had laid the foundation for economic take-off of the country as well as to facilitate the entrenchment of multi-party democracy in Ghana. He said to ensure the stability and steady development of the country, "we need to return Professor John Evans Atta Mills and NDC Members of Parliament to power to continue the good works embarked upon over the years". Dr Asamoah asked the electorate not to accept the claims of the ruling NPP that they were for democracy, saying that, they should be taken by their deeds and not by their words. He said the past four years in governance had exposed the NPP and Ghanaians now knew their true colours, their aspirations and persuasions. He said the NDC was able to meet the aspirations, development needs and peculiar problems of every nook and corner of the country. The NDC Chairman said the Party had the capacity of ensuring a better future for the vast majority of the people. He stressed that since poverty threatened the development of the country, an NDC government would strive to deal with the problem when it assumed the administration of the country in January next year. He said the country was going through difficult times due to the mismanagement of its affairs by the NPP Government in just four years, adding that, it was left to Ghanaians to determine whether to allow things to continue the way they were now or vote the NDC back into power. He declared the forthcoming elections were crucial in view of the hydra-headed problems facing the country and emphasised the need for the people to vote for Prof Mills. "We shall include the people in decision-making so that together we will build a better Ghana."